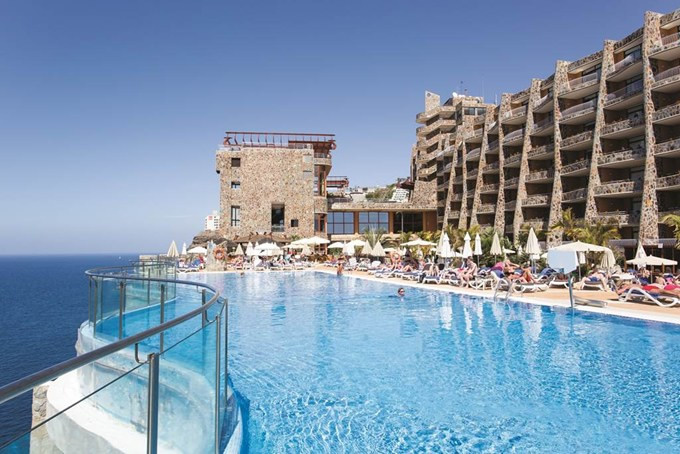 The 4 star superior Gloria Palace Amadores Gran Canaria is located in a peaceful setting and from its elevated position the hotel offers wonderful views of the sea and the nearby beach. 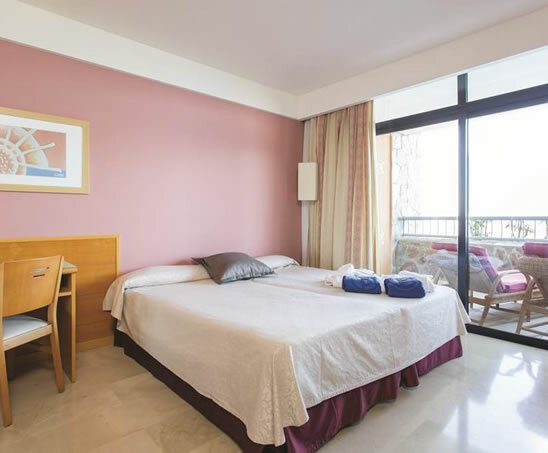 Situated 300m from Playa de Amadores beach, a panoramic lift connects the hotel directly to the pedestrian seaside promenade which goes from Puerto Rico to Playa de Amadores. The hotel is 800 metres from a choice of restaurants bars and shops and the main resort of Puerto Rico is 2.5 kilometres away. Car hire is recommended at this hotel. The hotel's guest rooms have adjoining twin beds, lounge area with sofa bed (ideal for a third member of your party), desk, air-conditioning, telephone, satellite TV, piped music, Internet connection (extra charge), safe hire, fridge, mini-bar service available on request (extra charge), fully-equipped bathroom, bath/shower, two hand basins, separate toilet, hairdryer and make-up mirror, furnished balcony with sea views. The maximum occupancy is 3 adults. Cots are available on request at no extra charge. Some rooms have a connecting door between them for family use. The hotel has a selection of suites with large separate lounges. 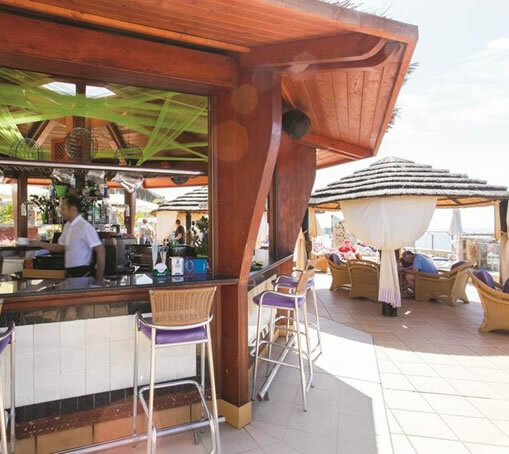 The Gloria Palace offers the full range of board arrangements from bed and breakfast to all inclusive (please check with us what is included in this package at the time of booking), meals are taken in the air conditioned and spacious main restaurant with sea views. There is an outside terrace exclusively for aperitifs or relaxing after your meal (no table service). Children can enjoy a buffet meal in their own special area. The hotel has a lobby piano bar, pool bar, snack bar, lounge bar and the 'Paseo' bar with big screen TV for sports events. The hotel has plenty of amenities including, fresh-water pools, with heating system, 2 adult pools and 1 children's pool, free sunbeds and sun umbrellas, pool towels available (deposit required and a fee applies for change of towels), separate, enclosed nudist area. Children have a playground, mini club for 4 to 12 year olds, separate monitored pool, entertainment and games during the day. The children can also have dinner in the restaurant with the children's entertainment staff, mini - disco after dinner in the Bar Salon. A Babysitter available on request (fee applies). 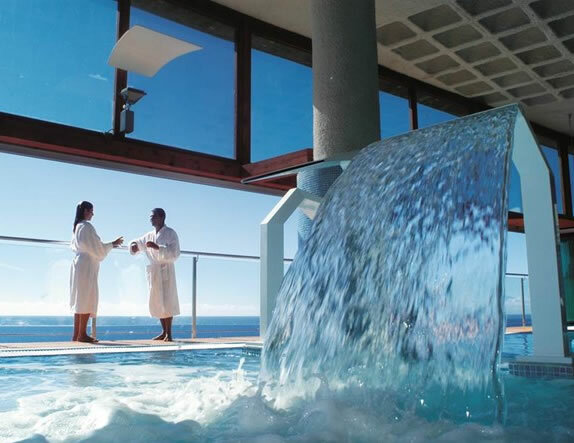 The most outstanding feature of the hotel is the Thalasso therapy centre. The centres 1,800 square metres are entirely given over to health, the facilities include, a dynamic pool, gym pool and the 'Get in Shape' pool, which consists of a relaxing circuit in seawater heated to different temperatures (33ºC/37ºC), and with 29 hydro massage points. The centre is located in the main building of the hotel and has spectacular sea views from the Get in Shape pool and the relaxation area. The treatments provided at the centre are for rheumatic conditions, post-traumatic disorders, stress-related problems such as nervous fatigue, anxiety and weight loss, as well as cellulite. In addition to the large 'Get in Shape' pool. One of the centre's main attractions the Talasoterapia Canarias San Agustín is equipped with a sauna, a large gym with modern therapeutic and sports facilities, a beauty salon, 35 cubicles for individual treatments and large relaxation areas. The Hotel also provides: table tennis, French bowls, archery, target shooting and darts. For an additional cost guests can use the tennis court (with lighting), hire a tennis instructor, use the Gym with the latest aerobic and weights equipmen, pool table. Other facilities include, Shops, unisex hairdresser, TV lounge with wide sports coverage (Sky Sport and Canal+), games room, 24-hour Internet corner, defibrillator, international newspapers available in the Lobby bar, cash dispenser and free covered parking.